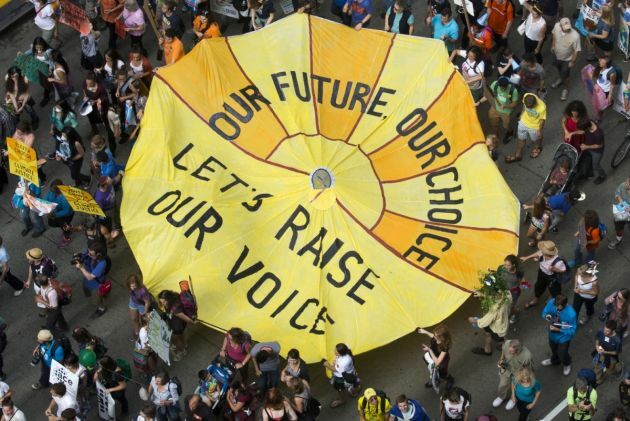 (Photo: REUTERS / Adrees Latif)Some of hundreds of thousands take part in the People's Climate March through Midtown, New York September 21, 2014. An international day of action on climate change brought hundreds of thousands of people onto the streets of New York City on Sunday, easily exceeding organizers' hopes for the largest protest on the issue in history. Organizers estimated that some 310,000 people, including United Nations Secretary-General Ban Ki-moon, former U.S. Vice President Al Gore, actor Leonardo DiCaprio and elected officials from the United States and abroad joined the People's Climate March, ahead of Tuesday's United Nations hosted summit in the city to discuss reducing carbon emissions that threaten the environment. The doubt U.S. President Donald Trump cast on a report by his own government warning of devastating effects from climate change as California was burning down at the beginning of winter seemed consistent with what he had said in the past. When he was asked outside the White House about the findings that unchecked global warming would wreak havoc on the U.S. economy, he said: "I don't believe it." The U.S. government report found that climate change will cost the United States hundreds of billions of dollars each year and will damage the health of the nation, the BBC reported. Trump's administration has pursued a pro-fossil fuels agenda and he is running against the preaching of the Catholic Church and other Christian religions about the protection of creation. The current U.S. administration is not along in its climate change denial. Brazil this week pulled out of hosting next year's United Nations global summit meeting on climate change, the latest signal that Latin America's largest nation no longer aspires to be an influential player in efforts to mitigate the effects of a warming planet. The decision leaves the United Nations scrambling to find a new venue for the conference, which was scheduled to take place next November, The New York Times reported. It comes about a month before the inauguration of president-elect Jair Bolsonaro, who has pledged to empower commercial ventures in the Amazon and other Brazilian biomes while weakening enforcement of environmental laws. This week a new UN report came out that countries are failing to take the action needed to stave off the worst effects of climate change, The Guardian reported. It said the commitments made in the 2015 Paris agreement, which the Trump administration is opting out of, will not be met unless governments introduce additional measures as a matter of urgency. It is likely that new taxes will be needed on fossil fuels, investment in clean technology and much stronger government policies to bring down emissions. Governments will have to stop subsidising fossil fuels, directly and indirectly, the UN said. Gunnar Luderer was one of the authors of the UN report and senior scientist at the Potsdam Institute for Climate Impact Research in Germany. He said, "There is still a tremendous gap between words and deeds, between the targets agreed by governments and the measures to achieve these goals." "Only a rapid turnaround here can help. Emissions must be reduced by a quarter by 2030 [to keep warming to no more than 2C (3.6F) above pre-industrial levels] and for 1.5C emissions would have to be halved," said Luderer. On November 22, the World Council of Churches, the Lutheran World Federation, ACT Alliance and the German Protestant development service Bread for the World appealed to world leaders to take swift and coordinated action to limit global warming to 1.5 degrees Celsius as a humanitarian and ethical obligation. "As faith-based organizations we are very concerned that marginalized, vulnerable, and poor people are affected by climate change impacts that are increasingly exposing them to emergencies and humanitarian crises," the four organizations warned. The 60-page publication is titled, "Limiting Global Warming," released today, just a couple of weeks before the December 4-12 climate conference in Katowice, Poland. They reiterated their sustained advocacy on climate change at the annual United Nations' conferences and other fora, the four organizations insist sound financial, technological and political solutions are possible. "If we fail to address climate change and to increase efforts to protect the affected communities now, we will bear the incalculable risks to future generations," they state in the publication's preface. On the other hand, they argue that increased efforts towards protecting the poorest and most vulnerable to climate change will be a significant step toward ensuring future generations are protected. Rev. Olav Fykse Tveit, WCC general secretary, said that the research is "important" in that it "focuses on those living with vulnerabilities and in impoverishment which is decidedly a Christian lens." Further, its conclusions reinforce the urgent appeal "to enact changes now and with conviction – that is, radically reshape our economic life – to safeguard God's most sacred gift of life." "Limiting Global Warming" was written by a team of climate experts and development practitioners from Africa, Europe and Oceania, who studied scientific literature and grassroots reports. It states that the Special Report on Global Warming of 1.5°C by the Intergovernmental Panel on Climate Change confirmed the convictions of partners and members of groups in the Global South that every tenth of a degree Celsius temperature rise profoundly affects their lives and livelihoods. Despite the 2015 Paris Agreement to keep global warming at 1.5°C, the world is "off-track," the authors maintain, adding that overshooting the goal would "severely jeopardize" the achievements of the United Nations Sustainable Development Goals. The publication identifies Small Island Developing States, Least Developing States, South Asia, Southern Africa, the Horn of Africa, the Mediterranean, the Middle East, Central America and Northeast Brazil as climate change "hot spots." If global temperatures rise above 1.5°C, agriculture, water health, coastal communities and cities, marine and tropical marine and (coral) ecosystems are most at risk. There would be heatwaves, erratic rainfall, storms, floods, droughts and rising sea levels. "This is not the future we want," the authors write, urging countries to "fulfil their responsibilities and ratchet up their NDCs (Nationally Determined Contributions) now." "Limiting Global Warming" recommends deep and fast reductions in Co2 emissions; multilateral cooperation; shifting investments to "green" or sustainable ones; addressing equity justice and climate justice to overcome the root causes of vulnerability; sustainable consumption; low population growth; and low energy and food demands.